Age of Exploration: Why did Europe want to explore the world in the late 1400s? 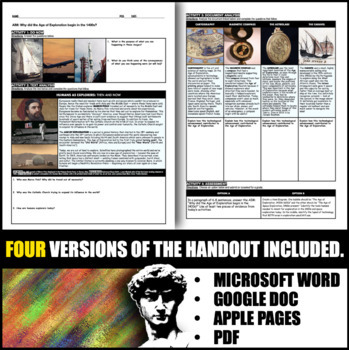 ACTIVITY 1 -- TEXT ANALYSIS: Students will read about the travels of Marco Polo and how he inspired people to travel more. 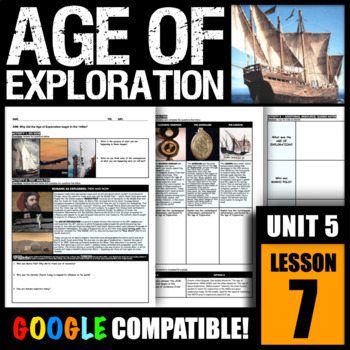 They will also read about and define the term "Age of Exploration" and learn about its beginnings. ACTIVITY 2 -- CRQ: Students will complete a CRQ in which they have to compare two documents about the Age of Exploration. Students should identify a cause-and-effect relationship between the fall of Constantinople and the need for a new trade route to Asia. The historical context for the need to travel is that Europeans came to rely on Constantinople as the gateway to Asia. After it's collapse, they desperately needed newer, quicker, and SAFER routes to Asia for trade. 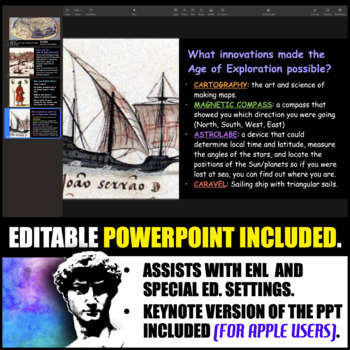 ACTIVITY 3 -- THINK/PAIR/SHARE: Students will work together to discuss how technology developed during the Renaissance impacted travel in the Age of Exploration. ASSESSMENT: Students may complete one of these activities as an assessment, or answer the AIM using the R.A.C.E.S. format (FREE Download Here).